A baby with clubfoot in both feet prior to treatment. 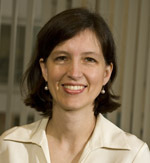 By performing a routine genetic screening on 66 patients with an inherited form of clubfoot, Christina Gurnett, MD, PhD, a Washington University pediatric geneticist and neurologist at St. Louis Children’s Hospital, and her colleagues found abnormalities in a region of chromosome 17 in four patients. Three of the patients had small recurrent DNA duplications, and one had a small recurrent DNA deletion on chromosome 17. The results will be published in the July 9 issue of the American Journal of Human Genetics. The researchers ran a test commonly used to evaluate children for neurodevelopmental disorders such as autism called a chromosomal microarray. Gurnett, assistant professor of neurology, of pediatrics and of orthopaedic surgery, said this is the first time researchers have used this kind of test specifically for isolated clubfoot. Nearly one in 1,000 babies is born with clubfoot and one-fourth of them have a family history of the birth defect, which causes the bones and joints of the foot to be aligned incorrectly. The condition occurs in boys twice as often as in girls. If untreated, those affected walk on the outside of their feet, which can lead to long-term pain and disability. Standard treatment for milder forms of clubfoot involves gentle manipulation and casting of the feet over several weeks then wearing a brace for several years. Treatment for more severe forms requires surgery. Initially, Gurnett and her research team, including Matthew B. Dobbs, MD, associate professor of orthopedic surgery at the School of Medicine, screened the DNA of 40 patients with inherited clubfoot. Two were found to have nearly identical DNA duplications on chromosome 17 in a region previously linked to limb abnormalities, developmental delays and heart defects. That DNA duplication was not found in the DNA of 700 control subjects without clubfoot. They then screened 26 additional patients and found another clubfoot patient with a duplication in chromosome 17 and one more with a deletion, resulting in four patients of 66 screened with defects on chromosome 17. To determine that the chromosomal duplications were inherited, the team ran the same tests on 10 family members of the three patients with the duplications. All of the family members who had clubfoot and the duplication were male. One female family member with the duplication had hip dysplasia but not clubfoot. Dobbs says the findings may prompt orthopedic surgeons to consider this readily available genetic screening test for children who have inherited clubfoot and may be at risk of hip abnormalities. In a 2008 study, Gurnett and Dobbs found that a mutation in PITX1, a gene critical for early development of lower limbs, was linked to clubfoot in humans. That was the first gene implicated as a cause of the birth defect, and Gurnett said it appears to be related to the abnormalities they have now found on chromosome 17. While TBX4 is the most likely candidate in the chromosome 17 region linked to clubfoot, Gurnett said more research and data are needed. They are now screening DNA from 1,000 patients with clubfoot to look for additional DNA duplications or deletions on chromosome 17. Alvarado D, Aferol H, McCall K, Huang J, Techy M, Buchan J, Cady J, Gonzales P, Dobbs M, Gurnett, C. Familial isolated clubfoot is associated with recurrent chromosome 17q23.1q23.2 microduplications containing TBX4. American Journal of Human Genetics. Online July 1, 2010. Funding for this research was provided by Shriners Hospital for Children, The Children’s Discovery Institute, St. Louis Children’s Hospital Foundation, National Institutes of Health, March of Dimes Basil O’Connor Starter Scholar Research Award, the Orthopaedic Research and Education Foundation and the Pediatric Orthopaedic Society of North America.